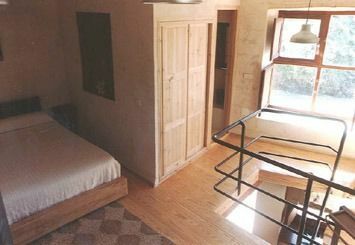 A series of common spaces to all the houses completes the facilities of CUEVAS DE VIÑAYO: LA SAUNA, at 1160 meters above sea level, with capacity for eight people with showers, toilets, washbasin and wardrobe; all in a unique environment, surrounded by pillars and stone walls, exterior wooden floors and exits to gardens and river suitable for bathing. COMMON ROOMS. There are two common rooms as a meeting area, ideal for conventions, etc. One large, for reading area or meetings with huge window of 4x5 meters overlooking the poplar grove, exit to small garden and table for at least twenty-five people.